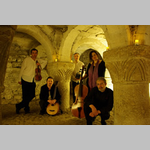 This wonderful 5 piece group from Oxfordshire are coming to help us celebrate our 51st Birthday. This will be a feast of traditional English folk music and as the band has eight CDs to their name so far we are expecting to hear some of our favourites. We are of course selling tickets for this evening so contact me as soon as you set eyes on this as I know they will be sold out before the night.